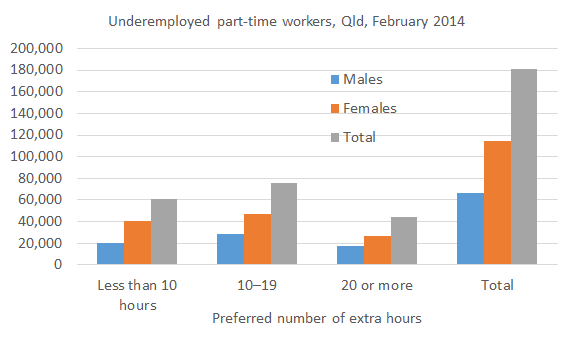 Queensland’s relatively weak labour market is reflected not only in the unemployment rate of 6.5%, but in a relatively high rate of underemployment, with around one-in-four part-time workers in Queensland underemployed (i.e. preferring to work more hours than they actually do). This corresponds to around 180,000 part-time workers (see chart below based on ABS data published yesterday). The predominance of women in underemployment reflects the predominance of women in part-time employment generally. Underemployment is an important aspect of labour utilisation, which is a broader measure of the state of the labour market than the unemployment rate. As Pete Faulkner has previously posted on, labour utilisation has worsened in Queensland in recent years (Underutilisation data). So Queensland’s lacklustre economy impacts not only those without jobs, but those with jobs, too, particularly casual workers who can’t get as many hours work as they would like. This entry was posted in Labour market and tagged abs, labourforce, qld, queensland, underemployment, unemployment. Bookmark the permalink.